The theaters of London are abuzz. In one week, her majesty the Queen will attend their new shows and will grant her support to one of the troupes. It's the chance of a lifetime for the young authors who are inflaming the populace with ever more audacious and motley plays. But how do you create a masterpiece in such a short time? Whoever has the answer to this thorny question will probably enter the rolls of history! 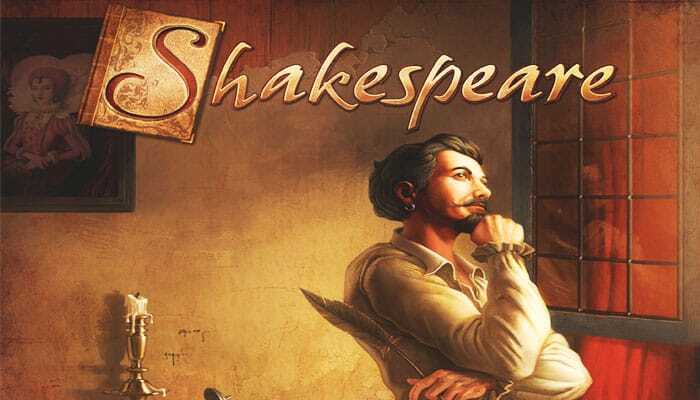 In Shakespeare, the players have 6 days to create the most grandiose play possible. They must recruit actors and craftsmen, put up stage sets, create costumes, and perform rehearsals. At the end of 6 days, the player who has created the most prestigious play wins the game. The main board is placed in the middle of the table. The Day token is placed on space 1 of the day tracker. The coins and the "+3" tokens are placed next to the main board. Each player chooses a color and takes: 1 individual board, 1 Recruitment card, 1 Game Reference card (adapted to the number of players in the game), 5 cylinders, 7 discs, and 4 Rest tokens. A disc is placed on the space of the Ambiance track with no icon (third from the left). A disc is placed on the space marked "5" of the Prestige track of the main board. A disc is placed at the beginning of each act (first circle) of the main board. The rest of the elements are placed in front of the player. One player takes one disc of each color, shuffles them, and places them randomly on the Order track. The player who is placed first on the Order track places their last disc on position 1 of the Initiative track, the second on position 2, and so on. Place the Stage Set elements indicated by the Game Reference card in one bag (for example, with 4 players: 16 black, 16 pink, 12 purple, 12 blue, 8 green, 8 yellow). In the other bag, place the Costume elements indicated by the Game Reference card (for example, with 4 players: 16 black, 16 pink, 12 purple, 12 blue, 8 green, 8 yellow). Randomly draw three elements from each bag per player (12 with 4 players, 9 with 3 players, and 6 with 2 players) which are placed on the main board, in the areas reserved for them. The Characters are shuffled and made into a deck. Draw two more cards than the number of players from the deck (meaning 6 cards with 4 players, 5 cards with 3 players, and 4 cards with 2 players). These cards are placed (face up) next to the main board. 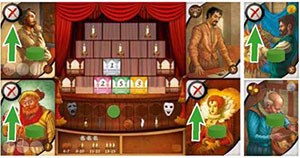 The player placed last on the Order track chooses one of the Character cards previously drawn, and places it next to their individual board. The player preceding them chooses one of the remaining cards and does the same. Proceed in this way until the first player. The remaining cards are discarded. Draw again from the deck two more characters than the number of players (meaning 6 cards with 4 players, 5 cards with 3 players, and 4 cards with 2 players). These cards are placed (face up) next to the main board. The game now begins. 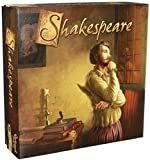 A game of Shakespeare is played over a series of 6 days. Each day is divided into 6 phases. Phase 4 (Dress rehearsal) is only played during days 4 and 6. Each player takes their 5 cylinders in hand and secretly chooses a number of them, which they place in their closed hand. These cylinders correspond to the number of actions which the player will perform on that day. Wagering at least 1 cylinder is mandatory. When all players have made their choice, they reach out their hands and simultaneously reveal the number of cylinders they have. Whoever has wagered the fewest cylinders takes the first position of the Order track and immediately scores 1 Prestige point, the second player takes the second position on the Order track, and so on. Ties are resolved by using the Initiative track of the main board: the player placed higher wins ties. The cylinders wagered by the players are placed on the individual boards. The player's other cylinders remain next to their individual boards. They will not be used on this day. The Initiative track is then emptied (the players' discs are placed beneath it). The players reveal their wagers. Red has wagered 2 cylinders, Green 5, while Blue and Yellow have both wagered 3. Red is therefore first. They take the first place and score 1 Prestige point. Blue and Yellow are tied, but Blue placed before Yellow on the Initiative track. Blue thus takes the second place and Yellow the third. Green takes the fourth place. The Initiative track is emptied. 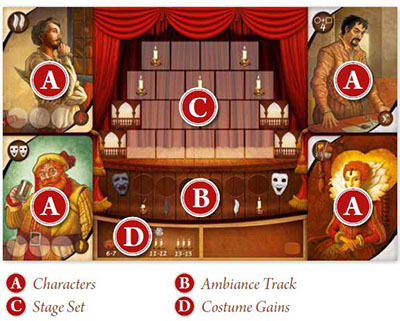 During this phase, the players act in alternating order: whoever is placed first on the Order track performs one action, then whoever is placed second, and so on until all cylinders and Recruitment cards are used. Note: it is possible for a player to end the turn alone (if they wagered more cylinders than their opponents). On their turn, a player can either recruit (only once per day) or activate a Character by placing a cylinder on it. The player takes their Recruitment card and replaces one of the Character cards available next to the main board with it. The Character card is then placed next to their individual board, either face up (meaning that they are hiring the character shown on the card), or face down (meaning that they're instead hiring an extra). This choice of side is final. The recruited character is immediately available for use. All of the Character cards have a cost which ranges from 1 to 5 Pounds (except for the extras, which are free). However, this money will only have to be paid at the end of the game. As a consequence, the players spend no money to recruit up-front. Reminder: to recruit, the player doesn't use a cylinder, only their Recruitment card. The recruitment is mandatory. However, if a player thinks that they will not have the means to pay at the end of the game, they can always recruit an extra. All Character cards showing a costume space and an activation power are actors. Their function is to make the players progress on the three Acts on the main board, but some also have special powers. Notes: the complete list of actors is presented on the reference sheet. The extras have no effect outside of the dress rehearsals (phase 4) and are not activated using cylinders. A player who moves on one of the Acts and reaches a space occupied by another player places their disc on top of that player's disc. Thus, the first player who reached the space is the one on the bottom of the pile. It is possible that a player can be forced to move backwards on a track (see Phase 3). If the player who moves back reaches a space occupied by another player's disc, they again place themselves on the top of that pile. As soon as a player activates an actor with a cylinder for the first time each day, they place their disc on the first available space on the Initiative track. There are three types of craftsmen: costume mistresses, set dressers, and handymen. 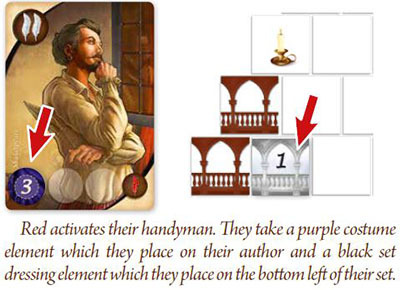 The craftsmen are identified by a Craftsmen symbol at the bottom right of the card. Important: The yellow costumes cannot be acquired by the costume mistress. Each actor/extra card can hold up to 3 costume elements. It's possible to start multiple costumes simultaneously. Thus, a player who takes 3 elements isn't obliged to place them on the same actor/extra. Any element placed remains where it is placed. 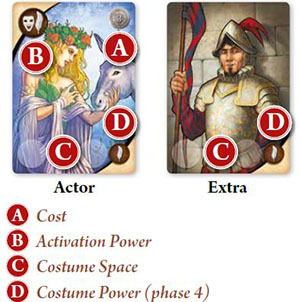 As soon as an actor/extra card contains 3 elements, the costume is complete: the player adds the value of the elements and immediately wins as many Pounds and/or Prestige points as indicated on their individual board (if they score less than 6, they earn nothing). It's possible for a player to take less than the value that their costume mistress allows them to. Costume elements taken must be placed immediately on the actors, following the tailoring rules. An element which can only be placed on an actor or an extra (meaning if all of the player's actors and extras have a complete costume) cannot be taken and remains in place. Note: the actors and extras who have complete costumes (3 discs of any value) will be able to activate their special power during the dress rehearsals. Important: The yellow set dressings cannot be acquired by the set dresser. The set is built from bottom to top. For example, to place an element on the second line of the set, the two elements underneath that space must already be placed. 4 "virtual" elements are already placed on the set to help construction. No set dressing element can be placed on these spaces. Any element placed remains so indefinitely. The set's colors must be symmetrical. For example, if the player places a pink set element at the bottom right, they will have to put a pink set element at the bottom left if they want to fill this space at a point in the game. However, nothing's stopping a player from first completely building one side of their set before starting on the other. As soon as they cover a space containing a candle with a set element, the player immediately scores 1 Prestige point. It's possible for a player to take less than the value their set dresser allows them to. The elements taken must be immediately placed on their set following the construction rules. An element which can't be placed in the set (due to the symmetry rules or from lack of space) cannot be taken and remains in place. Black set dressing element: no effect. Pink set dressing element: the player gains 1 Pound. Purple set dressing element: the other players move back 1 space on their ambiance tracks (towards the left). Blue set dressing element: the player moves forward 2 spaces on their ambiance track (towards the right). Green set dressing element: the player gains 1 "+3" token (see further). The handyman works as both a set dresser and a costume mistress at once. When activated he thus takes both set dressing and costume elements (non yellow) at once for a maximum total value of 4 and places them following the same rules for placement as explained earlier (it's of course possible to take only set dressing elements or costumes). The "+3" tokens allow the craftsman to increase their value. When a player activates an artisan and owns a "+3" token, they can choose to discard this token to temporarily increase the value of this craftsman by 3 points. The token is then returned to the reserve. It's not possible to play two "+3" tokens simultaneously, or play a "+3" token you've just acquired in the same action. 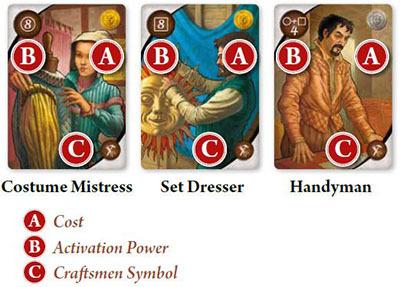 Note: the "+3" token doesn't work with actors (only with the craftsmen). When the jeweler is activated, the player takes either a yellow set dressing element, or a yellow costume and places it according to the rules previously given for set dressing and actors (or extras). For the calculation of the costume's value, a yellow element is worth 3. For the set dressing, the yellow element is a joker: it replaces any color for the symmetry rules (without any extra power). Note : all yellow elements placed by the player will earn that player one prestige point at the end of the game. The assistant cannot be activated (no cylinders can be placed on it). He grants a permanent power to the player: for each assistant they own, the value of all of the player's craftsmen are permanently increased by 1. Note : the assistant's power doesn't work with the actors (only with the craftsmen). draw 3 Objective cards, choose one and place the other two on the bottom of the deck (the Objective cards are worth points at the end of the game, they are explained on the reference sheet). A player doesn't have to place all of the cylinders they had planned for in phase 1. At any point, they can decide to end their activation, even if they still have cylinders left to place. This phase then ends for them. Important: If some players did not activated an actor, they are placed on the Initiative track after the players who did, in the order of their places on the Order track. Once all of the players have placed their cylinders and recruited, each player in the turn's order, checks the ambiance of their troupe. Each purple set dressing element still present on the main board makes the ambiance of all players move back 1 space. Note: a player cannot go past the end of the ambiance track, even if a gain or loss would push them past it. If it's completely to the right (lit candle), they win 1 prestige point. The ambiance of each player is reset to zero (the disc is returned to the space with no symbol). There are still two purple set elements left. All players thus drop their ambiance by two spaces. Blue therefore ends up on the "1 Pound" A and gains 1 Pound. Finally, they bring their ambiance token back to the starting space B. The phase is over. Note: this phase is only played on days 4 and 6. Two dress rehearsals take place during the game. On day 4 (the "initial dress rehearsal") and on day 6 (the "final dress rehearsal"). During these rehearsals, the actors and extras which have a complete costume (3 discs) will benefit from their costume's power, which will allow players to advance the various Acts. Finally, the Acts are scored. In the order indicated by the Initiative track, the players follow this procedure: for each actor or extra with a complete costume, they move as many quills as indicated in the rehearsal zone of the Character card (the main power is not activated). White quills allow the player to freely choose the track. If a player reaches the end of a track, that player may no longer advance on that track. Other players who reach the end of that track place themselves on top of the disc on the same space. Important: an actor can take part in the dress rehearsal even if blocked by a Rest token. Note: The powers of Viola and Hamlet are special. They do not allow players to move forward, but grant a bonus during the rehearsal phase to the player who acquired them if these actors have a costume. Act I (red) : each player on one of the first three spaces loses a Prestige point. Each player who has reached the fifth space gains 1 Pound. Each player who has reached the seventh space gains 3 Pounds. Each player who has reached the last space gains 5 Pounds. Act II (yellow): each player on one of the first three spaces loses a Prestige point. The player who is furthest along the track scores 2 Prestige points and the second-most advanced scores 1 prestige point. Reminder: if multiple players are on the same space, the first player to have reached that space (at the bottom of the pile), is ahead. Act III (blue) : each player on one of the three first spaces loses a Prestige point. Each player who reaches the sixth space gains 1 Prestige point. Each player who reaches the eighth space gains 2 Prestige points. Each player who reaches the last spaces gains 3 Prestige points. On day 4, Red performs his dress rehearsal last (they are fourth on the Initiative track) From among their character cards, Lady Macbeth, Hamlet, and an Extra each have a complete costume. They thus take part in the dress rehearsal. The costumes of the Author and Falstaff aren't complete, and so they do not take part in the dress rehearsal. Red progresses on each of the three acts thanks to Lady Macbeth A. 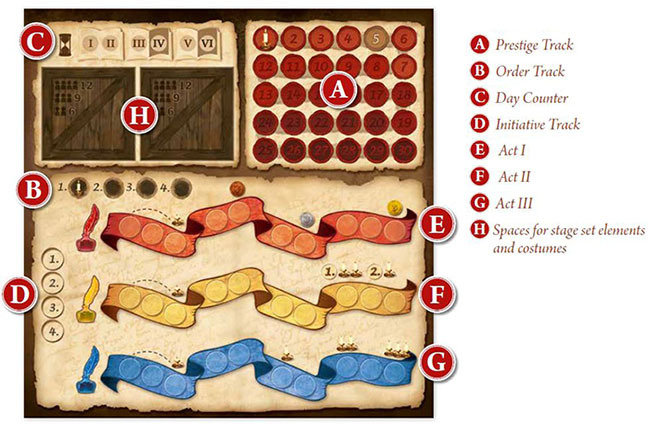 The Extra gives them a white quill and they choose to use it to progress on the yellow track B. Finally, they gain 1 Prestige point thanks to Hamlet C.
Note: on day 6, there is no maintenance phase. The unrecruited Character cards are discarded and the players recover their Recruitment cards. Two cards more than the number of players (6 with 4 players, 5 with 3 players, and 4 with 2 players) are drawn and placed next to the main board. If there are not enough cards left, the discarded cards are shuffled to form a new deck. The unclaimed costume and set dressing elements are discarded. New elements of each type (12 with 4 players, 9 with 3 players, and 6 with 2 players) are drawn from the bags and placed on the main board. Note: the players can, at any time, check the discard pile for the costume and set dressing elements. Using their Game Reference, they can therefore determine the elements which yet remain to be drawn from the bag. The Day token is moved forward one space. Simultaneously (without checking what their opponents are doing), the players must now block all the characters they've activated except for one. They thus take as many Rest tokens as the number of cylinders used on this turn minus one, and place these tokens on the activated characters of their choice (it is impossible to block a character which has not been activated on that turn). These characters are resting and will not be able to be activated on the following turn. The Rest tokens will be removed at the beginning of the next rest phase. Once a player has performed their blocking, they recover their cylinders. Note: The block only concerns the Characters which have been activated. This way, if a player had wagered 5 but only used 4 cylinders, they only block 3 characters. As Assistants and Extras cannot be activated, no Rest tokens can be placed on them. On this turn, Green used 5 cylinders. They thus take their 4 Rest tokens and block the Queen, Falstaff, the Author, and their Set Dresser. Their Jeweler will therefore be available during the next day. They then recover their cylinders. None of the blocked characters may be activated on the next turn. The game ends after the dress rehearsal (phase 4) of the sixth day. Each player reveals their Objective cards in the order of their choice: they score from 0 to 3 Prestige points depending on the failure or success of each objective. Each player scores 1 Prestige point for each Yellow element in their game area (set dressing or costume, even if the costume is incomplete). Each player pays their Characters. '1 liey take all of the Pounds they've earned during the game and freely distribute them on their characters according to their costs (1/3/5). Each Character who is not paid costs the player 2 Prestige points. The player with the most Prestige points wins the game. In case of a tie, the player with the most Pounds left over among the tied players wins the game.